A few years ago, I found out about a very well-known contest. At the time, I was struggling to get anything published. I thought this contest would be a good one to enter because it goes on all year. First, I needed a story idea. That night, while watching TV, I pondered a good story idea that could show off both of my strengths…suspense and the supernatural. Instantly the thought of magical murders committed by a witch strike my mind. Immediately after that, I knew I also wanted a witch to be the detective on the case. I wrote it, edited it, and sent off. But I did not win that contest. 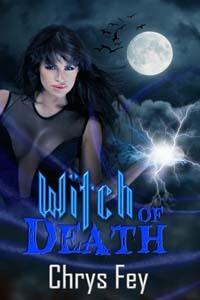 That story changed over the years with the help of beta readers and now it is Witch of Death. I have several techniques I use to name my characters. Many of my characters are named after names I picked for my future, unborn children. I figured I wouldn’t have dozens of babies, so I had plenty to use. Libby and Reid, the main detectives in Witch of Death were named this way. Another option that is fun is looking at movie credits and street signs. Yes, I’ve named some characters after streets. Sometimes, though, I do name characters after real people. Liberty Sawyer glided swiftly through the horde of police officers, reporters, and on- lookers. Black hair fell from a rigid part in the middle of her scalp to her hips. Her eyes were a soul-stabbing blue and her lips were blood-red. She towered over the other officers on the scene, and wore all black, which set off 6 the pallor of her skin.